There was megawatt hype surrounding Momofuku Seiobo before it even opened a few weeks ago, and the restaurant didn’t so much quietly launch as blast off. 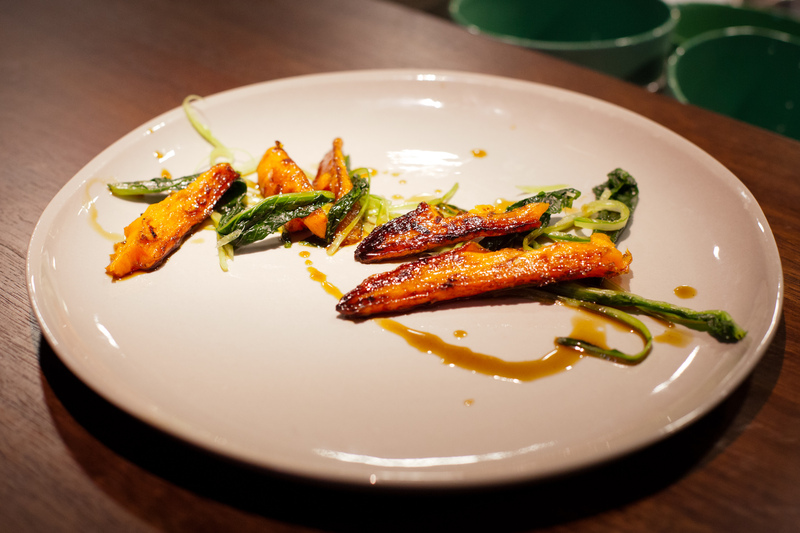 With supercharged interest in David Chang’s new Sydney venture – his first outside his New York empire – every minor move and detail was reported on before diners even entered the establishment. Maybe certain media outlets have returned to a stable condition after becoming hilariously over-obsessed with the online booking system (did it really deserve a news story on ABC radio, for instance?) – somehow people are really freaked out by the idea of setting up a login to make a reservation for a restaurant! It’s not exactly something you need heavy I.T. back-up for, and I wonder if these same people also need someone to hold their hand to buy books and music (or anything!) on the internet, too? 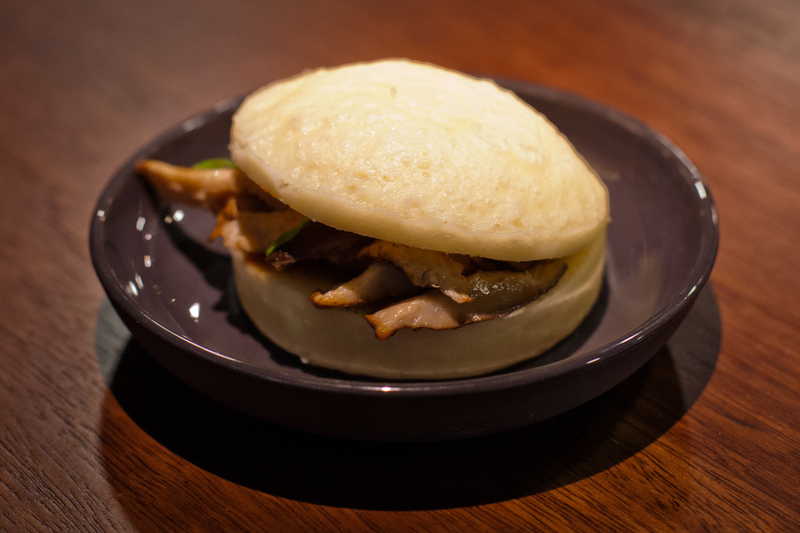 There’s also been many column inches on whether Chang’s famous pork bun would take up dual residency and spend time on his Sydney menu, too (given the fanfare/gushing that his signature dish has notched up over time, media interest directed at this is way less baffling). And maybe you can measure a restaurant’s hype by the slight amount of crazy that you are willing to indulge to get a seat there. So, when reservations first became open – offering only 10 days to pick from – the only night I was “free” was the same date I was moving house. So I went with that. After you get up at 5am to pack the hell out of your flat for the 7.30am arrival of removalists, only to spend the rest of the day sweatily carting everything up four flights of stairs, the idea of sitting down, period, is the most luxurious concept in the world. Even sitting down and eating a meal that actually involves cutlery (or a plate instead of a takeaway paper bag) feels like five-star decadence. 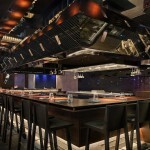 But I don’t think that was the commanding reason that Momofuku Seiobo outblazed so many dining experiences we’ve had. There’s nothing standard-issue about this restaurant – it is a pretty exciting place to be. Black bars lace up and down the exterior of Momofuku Seiobo – these view-obscuring lines almost camouflage the restaurant; stealing an outside glimpse is like trying to pry through someone’s venetian blinds. It’s the opposite (literally and direction-wise) to Adriano Zumbo across the walkway – dark, low-key and closed-off compared to the hyper-bright, attention-seeking patisserie funhouse. (Even though the contrast levels could not be higher, both spaces are actually designed by the same Sydney studio, Luchetti Krelle.) 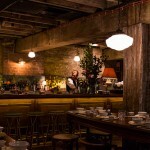 Inside, the restaurant is understated and dark – but everything is far from hidden. In fact, if you’re lucky enough, you’ll end up staggeringly close to the chefs in the most open of open kitchens I’ve seen. The borderline between you and them is a Japanese-style bar, and as you sit there, your focus pinballs between all the cooking and plating up and dishes coming to ingredient-by-ingredient life. It’s a visual primer on hierarchy, with the most junior chefs at the back and the higher in ranks at the front or centre: Ben Greeno (head chef), Clayton Wells and Chase Lovecky (sous chefs) and, when we were there, Peter Serpico (from Momofuku Ko and consultant at Seiobo) and, of course, David Chang. 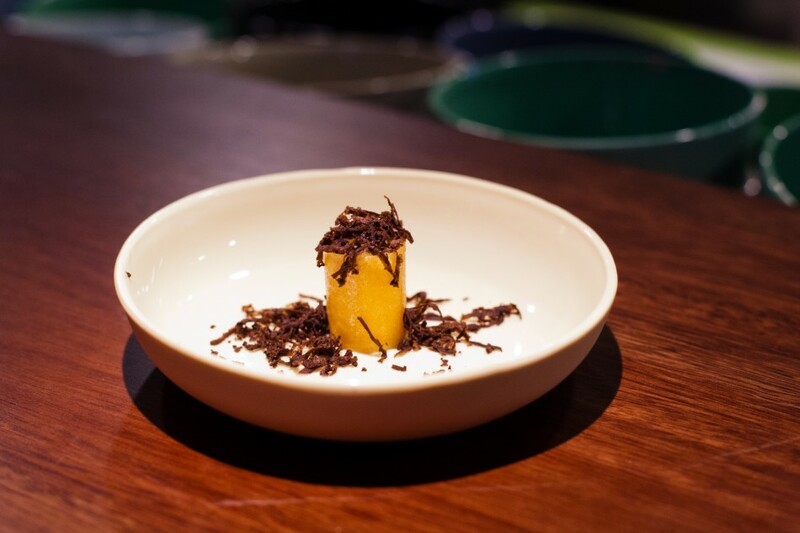 The first dish Ben Greeno gave us was a snack plate, with a dehydrated shiitake chip (imagine an ultra-mushroom-concentrated crisp), nori that resembled a prawn cracker and spicy mochi. It was kinda fun, like a fine-dining take on Asian supermarket nibbles. Enter stage right, the famous Pork Bun, with its dynamite mix of pork belly, cucumber, hoisin and apply-as-necessary sriracha hot sauce. I could see Will’s brain go “!!!!!! !” as he ate it. Mind blown with every bite. I was given a version with some heavy-hitting shiitake, which might’ve resulted in the odd internal exclamation mark, too. Sliced Trumpeter made the first of two tasting-menu appearances, accompanied by swirls of native warrigal greens and furikake (a Japanese seasoning often sprinkled on rice). 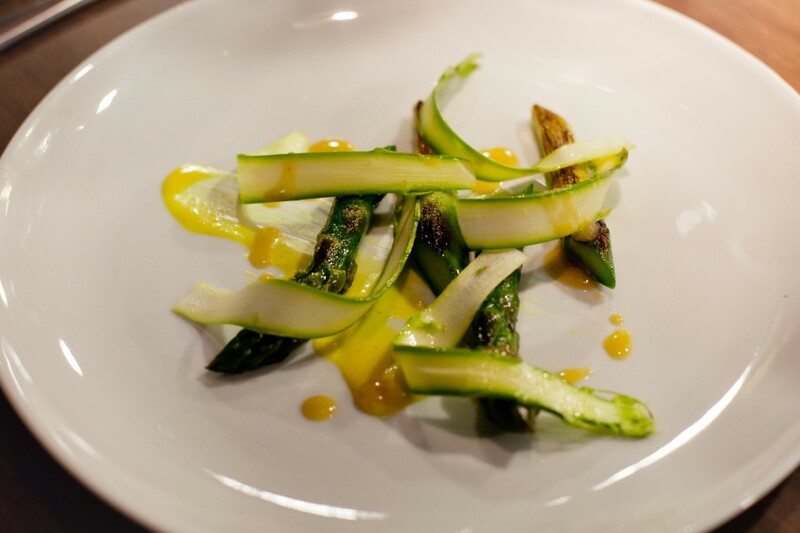 The vegetarian version had Golden Beets and pickled golden raisin. 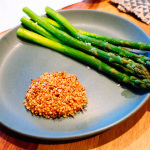 That was followed by ribbons of grilled asparagus, dressed with lemon puree and Marron with white asparagus and Szechuan white pepper for Will. We compared the Momofuku Seiobo experience to being at a gig. All we knew was that it would take at least two hours and although we could optimistically squint at the “set list” taped on the kitchen counter, we had no idea what was coming next. And like a concert, the build-up was key, with warm-up numbers at the start and proceedings amping up and bigger hits saved ’til closer to the end. We both really liked the next dish and it felt like things were really starting to jack up. My course was presented beautifully – pink-edged radichio leaves served with fermented black bean, radish and watermelon ‘ash’. Will’s variation came with wagyu beef. I liked how lively mine was – and how the burnt watermelon was a total coinflip, flavour-wise, both charred-through yet zippy, refreshing. Will also loved the Smoked Eel Dashi with summer vegetables, accompanied by eel brandade. My Shiitake Dashi was a full-punch broth, nothing watery or flavourless about it all. Near the bottom of the bowl, it did become a little salt-bomb-ish, though. The accompanying pomme purée (sweet, rich and amazingly soft – like fried potato in cloud form) with black truffle shavings was pretty awesome. Described plainly as Spanner & Swimmer Crab; butter, pepper and biscuit, this course was actually a reimagined Yorkshire pudding with the aforementioned crustacean. I was given a cauliflower dish which was baffingly great. Somehow, grilled cauliflower (which is heavyweight amazing in its own right) paired with the pickled part of the same vegetable, is a knockout. The crunch of pistachio is just a bonus. Dear Egg, Toasted Rice, Brown Butter, you won this round – you fooled me into liking slow-cooked egg. It’s a fine-dining staple I usually am grossed out by – it often just tastes like yolky goo to me. But this was really substantial, more like a savoury custard. I also liked the added sprinkle of green tea leaves and roasty brown rice. It reminded me of genmaicha, I thought. “That’s basically what it is,” said Ben Greeno. During the night, we’d seen the chefs open containers marked “pickled tomato” and we were wondering when it’d finally get acquainted with our plates. Turned out this ingredient was rolling with the Hand-Torn Pasta crew, and what an entourage. Fat ribbons of pasta with deep-fried mint, chilli, secret-weapon tomato (sweet, deeply flavoured, with a zingy, tart twist) and goat’s curd that had been aerated to the point it was as whispery mild as ricotta. This course was an open-and-shut case of “whoa, amazing!”. While it seemed like an ultra-contemporary Italian offering, the Asian chilli accent clues you into its origins – it’s actually inspired by a dish that David Chang had in Cambodia. He then served his staff a version that had rice noodles before it was reincarnated into this pasta rendition. Striped Trumpeter got an encore performance. Sourced from Mark Eather, it also used the head and bones as a broth, so you experienced three ways of one fish; it received plate back-up from fried-potato-like soil, stem of broccoli and some horseradish. 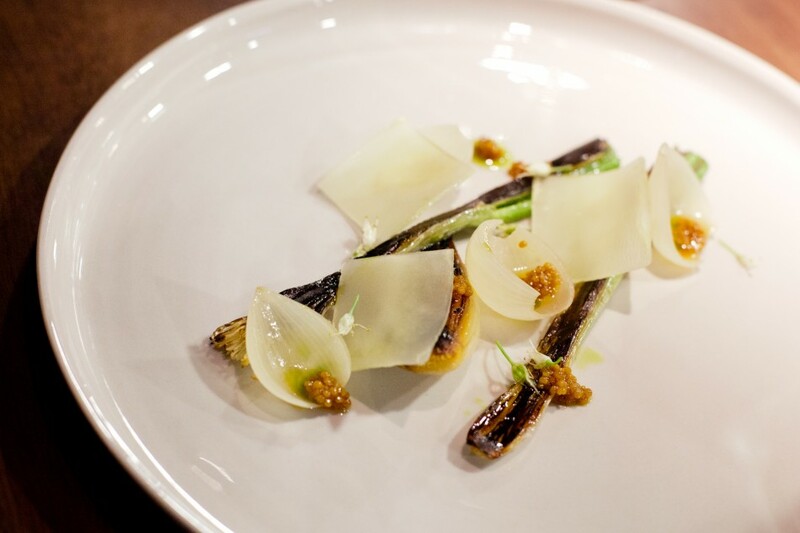 Leek flower, charred and caramelised, partnered with pickled mustard seed was my next round. Around this point, pork shoulder “sugary, messy and cooked for 10 hours” appeared like a guest of honour, getting major attention under a heat lamp in the centre of the kitchen. 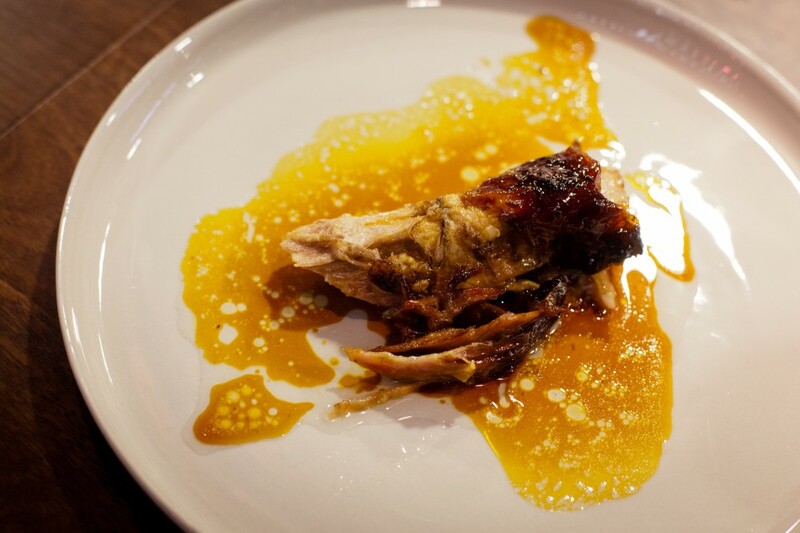 David Chang explained to the diners next to us that it had just came out of the oven.”Here’s some wet towels,” he said, as he served them the gloriously finger-staining course. On the tasting-menu front, the only thing I didn’t entirely love was the pickled turnip in the next dish. It was like a saxophone solo: overamplified, earning attention for all the worst reasons and a misfit – it just didn’t go with anything (sorry jerusalem artichoke and crispy potato – you really tried to make it work). So in light of this, Momofuku Seiobo had a genius/oddball (often the same thing, right?) solution, where cheese = dessert. Tiny tiny curls of pecorino were served with licorice honey and cider jelly. 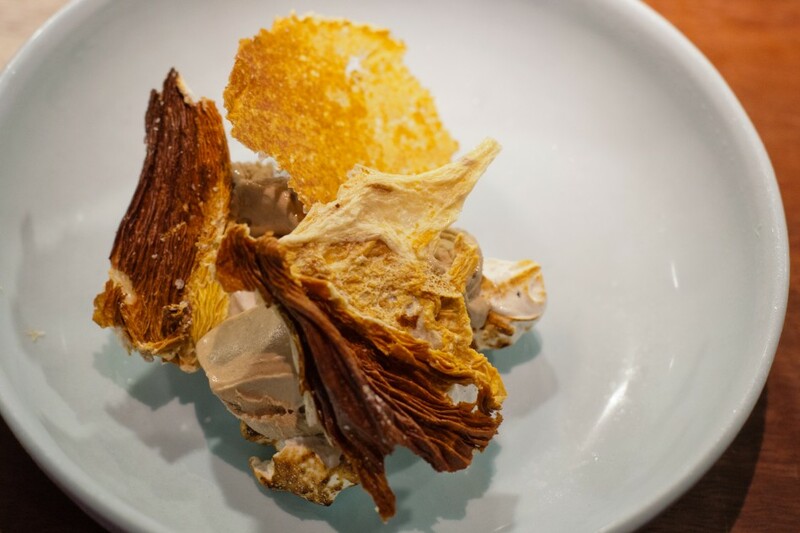 The next dessert felt like childhood bedtime, with malt ice-cream, wattleseed, meringue and crispy milk skin that fans out fantastically like mushroom gills or tidal drift washed up on a sandbank. I don’t mind toasted milk skin, but am wondering if it’s going to be the culinary equivalent of Autotune (used everywhere to the point of overkill?). 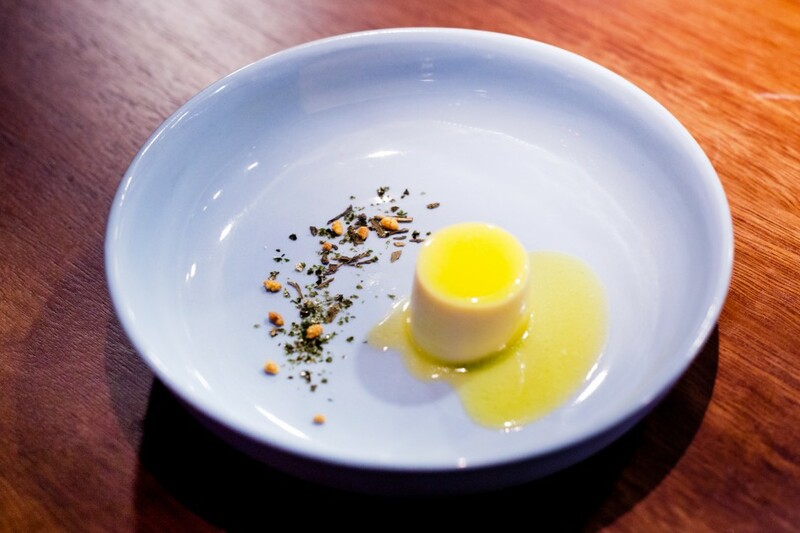 In a small amount of time, it has appeared in a lovely dessert at Oscillate Wildly; Tom tells me it popped up at Quay during a recent degustation, and now, here. And then to close, miso ice cream, dehydrated fruits, rice pudding and, yes, mustard. So that was it. Or was it? The pork shoulder, on bright-lit display in the kitchen, confused us. We’d seen other people around the room tear into it, safeguarded by an ample napkin supply, but it hadn’t ever appeared on Will’s menu. But its logical sequence, before the desserts, had never eventuated. Maybe it was a special thing, just reserved for select diners, not nobodies like us. Given that David Chang made his name reordering the rules, this seems perfectly logical. And, you can see why he would choose this point to be the finishing line. The way people react to the candied pork – it’s like they’ve taken a wonder drug. It’s a knockout moment – the perfect instance to wind things up. If you’re a vego, you get super-sweet roasted carrot served with bitter greens. And yes, you eat it, messily, with your fingers, too. I love that that’s the totally unpretentious way that Momofuku Seiobo interprets fine dining conduct. 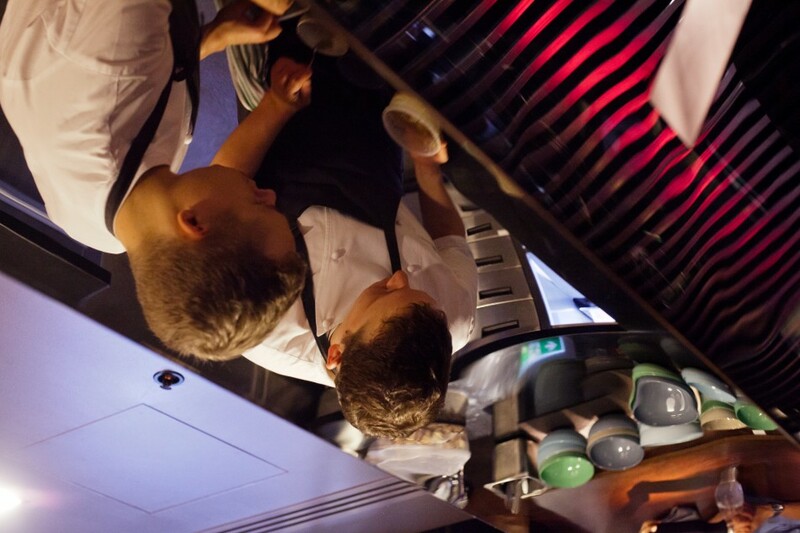 I also love that, by the time service is over, you can actually chat a little to the chefs. We asked Ben Greeno where he liked to eat in Sydney and he shortlisted Ms G’s and Duke Bistro. What a full-circle compliment, as David Chang’s way of compounding fine-dining with limitless daring and fun feels like it was a vital inspiration to those restaurants. (Also, the latter establishment seems to be an inhouse favourite; Clayton Wells recently tweeted: “Freak night off… Where else but @dukebistro good times!”). 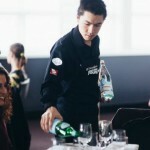 We wondered, too, if Ben Greeno found it awkward or confronting to be so exposed to all the diners, given the open-kitchen set-up. He said at the beginning of the night, it is a bit strange, but people get more relaxed as the night goes on (or diners slowly become more drunk). 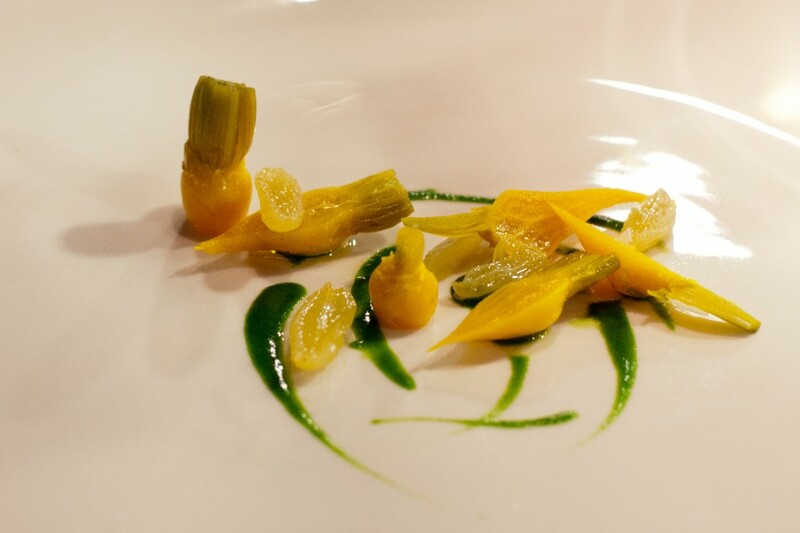 I had to pipe up and say how impressed I was by the vegetarian menu – how nice it was that it wasn’t afterthought food and that it was truly adventurous. 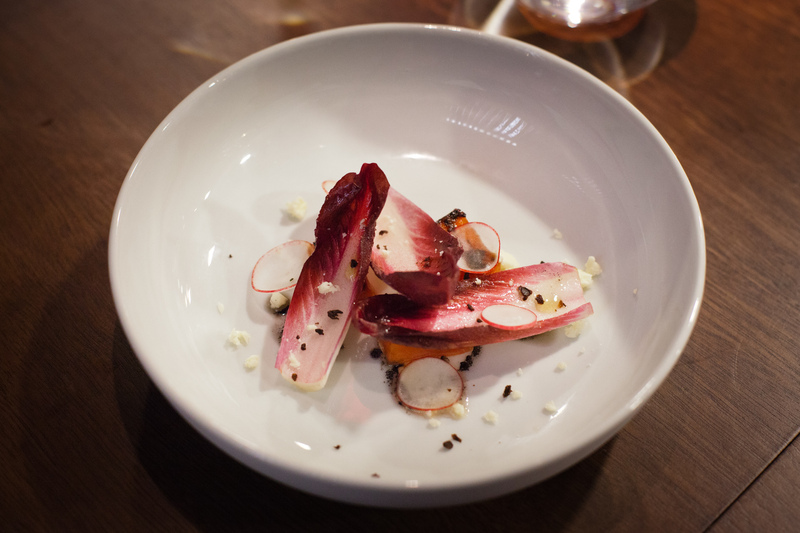 “Thanks for not doing the cliche of beetroot and goat’s curd,” I said. “Or mushroom risotto,” he said. Yes! A chef that is on side! He said they would do more vegetarian if they could. He also talked about adjusting to the differences in Australia – how even the water is different and ingredients (cream, for instance) doesn’t have the same fat content. He was incredibly won over by some of the produce here, especially the Mark Eather fish. Something I also really liked about Momofuku Seiobo was the music. You know it’s going to play a role when you walk into the restaurant and there are two massive photographs of Angus Young. Apparently they’re there because AC/DC is “Australia’s greatest export”. As for the restaurant soundtrack, it switches from Yeah Yeah Yeahs to The Kinks to Wilco to Grandmaster Flash. It even progresses through the night – it started all dad-rock when we arrived, got a little ’90s angst and then post-9pm, it was like an endless hip-hop mixtape. The playlist is picked by David Chang and it’s refreshing to hear some personality in what’s aired, instead of audio wallpaper, like smooth jazz or some generic (ugh) chill-out compilation (please stop making those things). Will and I alternated between going “oh, it’s this song!” to Shazaming the remaining tracks. And as one waiter said, it’s more fun to work to. And as for some of the criticisms Momofuku Seiobo has received (mainly for the online booking system and having to pay the $175 tasting-menu price if you cancel on short notice), it’s way less annoying than trying to get through to a restaurant with an endlessly busy line/no answering machine, a restaurant that has a six-month wait for a Saturday evening service or a popular place that takes no reservations at all or only lets you in after crazy-long queues. I’d take booking online over any of those scenarios – and the Internet option is so lazybones-friendly, you don’t even need to get out of bed to do it. This system is no more inconvenient than trying to buy concert tickets – and if you don’t turn up to a gig, the promoter already has charged your credit card, anyway. Also, the hard-luck whining about how “difficult” it is to get into an expensive restaurant is so hilariously “first world problem” that it really doesn’t deserve the media attention it’s received. 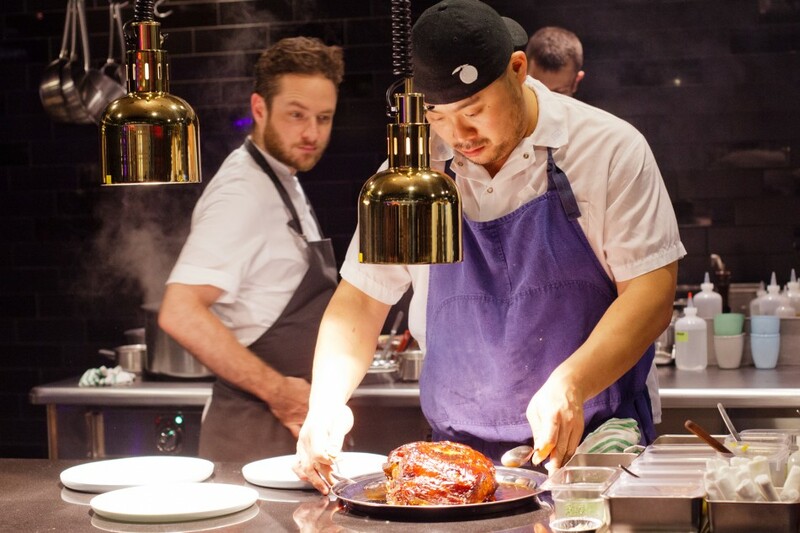 Even though it’s been open for less than a month, there’s already speculation that Momofuku Seiobo is going to change Sydney dining. I’m no forecaster, but I do know that this restaurant has an uncapped imagination and a livewire sense of culinary adventure. It’s not tailing behind any other local establishment for ideas, it is resolutely and confidently doing its own thing. 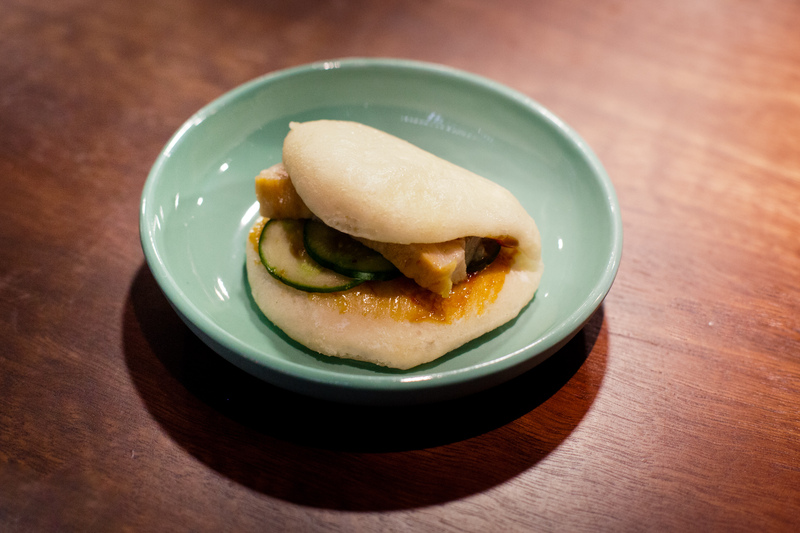 Momofuku Seiobo is smart, pathbreaking, energised and a megadose of fun. Go grab a seat. We also loved our meal at Seiobo….just brilliant. Love the way they catered the menu to suit my somewhat fussy ways. Have to say you scored better with your sweet roasted carrot….the eggplant that ended my meal, while not bad, was not spectacular and after the meal that preceded it, it was a bit of a letdown. I seriously can’t wait to go back. Wow, clever and beautifully presented food. We’re lucky to have one of Chang’s restaurants in the city. Chang is pure genius! I cant wait to go!! loved this post! felt like i was living/eating vicariously through you! Fantastic review! Entertaining, informative and deliciously descriptive 🙂 The online booking brouhaha was rather amusing! excellent review. couldn’t agree with you more! 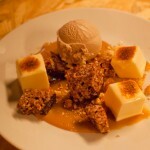 Loving the food pics. They look awesome. Especially like the look of all those yummy sweet things. looks sooo yummy! i cant wait to gooo! i love your blog and always check it to see what the haps are! also your pictures have inspired me to stand up and get a proper shot instead of sneakily snapping away from my seated position. Great review. I must admit hitting people that cancel on short notice for $175 is a bit steep. Considering what you go through to get the reservation and the fact people would snap up the vacant seats in a heart beat. Great writing as usual, but I disagree with you re the reservation system. Pain. In. The. Arse. Most people would be at work at 10a.m. when booking, so I’m sure the boss would be thrilled. But the food is very good and the service impeccable. I just wish the chefs would smile a bit more when they served the food. Great review! I am more excited by the playlist than the food. Love the fact that the music and food is both just as good as each other. It is the perfect match.